can start at any point. from injury recovery, to dynamic workout. Our approach to Pilates makes us different from the rest. We offer you small class sizes, the latest equipment and the most dedicated team of highly trained Pilates and body-work professionals. We base our teaching on the latest research about movement, fascia and biomechanics, proven to achieve results and influence your alignment, your movement and your health. There are times when you need a little extra input in your path towards alignment and freeing the body from pain or restriction. to help you restore and heal. 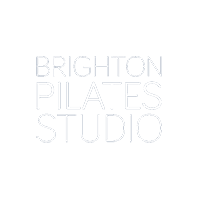 Brighton Pilates Studio is also a training school. Evolve Movement Education is our partner company running a Comprehensive Pilates Teacher Training from the studio. Ana Barretxeguren also runs her Moving Fascia course, a fascial anatomy course for Pilates and movement teachers and bodyworkers.